Up from the dank earth mottled with rotten leaves rise the Ghouls, wearing the phosphorescent lichen of their tombs like an ectoplasmic burial shroud. Sullen and mournful, they sulk through the moonless night with empty eyes, blind hands groping methodically for the fresh innards of an unlucky passer-by. The figure collector's version of foil-stamped comic book covers, hobbyists are drawn to glow-in-the-dark plastic like moths to a flame. 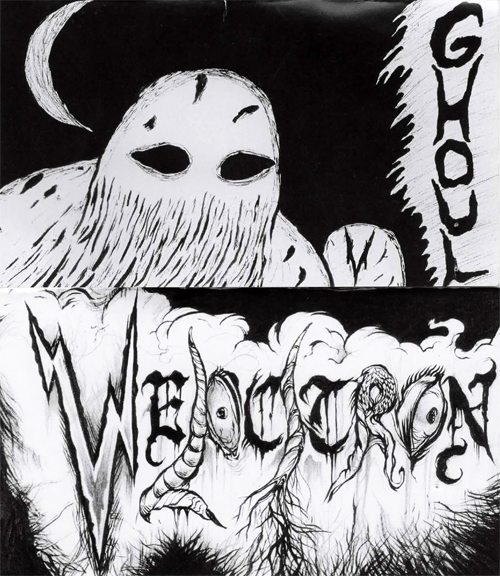 The Ghoul is the latest in Koenji-based figure maker Velocitron's attempts at world subterfuge. Standing at a petite 4 inches, they make the perfect henchmen for your other Kaiju overlords. And if Velocitron is going through the trouble to create ghastly underlings, you know that their unspeakable leader can't be that far off... I'm guessing we can expect to see something either at Super Festival or Wonder Festival next July. Ghoul package front drawn by Velocitron, back (Velocitron font) by TSB favorite Lamour Supreme. Writing and photos by Tokyo Scum Brigade. Unauthorized use will result in upside down crucifiction. Awesome Inc. theme. Powered by Blogger.